all the food you wanted. Don't work for food that spoils. Work for food that gives eternal life. The Son of Man will give you this food, because God the Father has given him the right to do so." "God wants you to have faith in the one he sent." I returned to work this week having left the sunny and warm weather of Malta. It was lovely to see the children well settled into Term 3 and for the great welcome back I received. I had a very relaxing Long Service Leave knowing that our School was in very capable hands. I wish to thank our staff, in particular, Mrs Rebecca Clarke as Acting Principal, for ensuring the smooth start to the term. Despite the cold, it is lovely to be back within our community. Students have been busy undergoing various activities this week. Our Years 9 and 10 students have been involved in the Bishops’ Religious Literacy Assessment and the Chemistry Competition. The BRLA testing will continue with Years 3 and 5 in the coming weeks. We thank our staff for ensuring that our students are prepared for these activities and competitions. 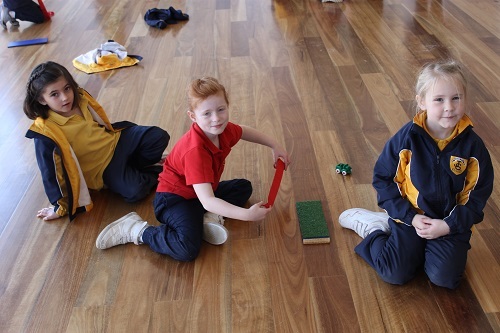 Our Primary students enjoyed the Scitech Roadshow incursion this week as they were able to experience a variety of hands-on science activities. Do ask your child about the incursion as our students enjoyed it immensely. On the Secondary campus, our Year 11 Geography students visited the Swan Valley and our Year 9 students attended the annual Eadine Springs Field Trip. Another busy week! Thank you to our parents who have been able to attend parent teacher meetings over these last few weeks. Our final evening was held yesterday and we thank our staff for making themselves available to conduct these important meetings. If you wish to contact your child’s teacher/s, you are welcome to request a meeting or return phone call by contacting the Admin Office on each respective campus. You are encouraged to make contact if you have any concerns or questions. For general enquiries, our Heads of School, Mrs Caroline Parnham and Mrs Rebecca Clarke can also be contacted via our Admin Offices. Last weekend, two of our Year 6 students; Lily Parker and Charlotte Stephen, participated in the International Highland Dancing Competition in Sydney. Both girls performed at a very high standard and received a number of Awards. Well done, Lily and Charlotte. Our School photos arrived this week and have been sent home today. Please check your child’s bag if you are yet to receive yours! For any issues, please contact the relevant Head of School. We congratulate Mr and Mrs Shane Bransby on the arrival of their new son. Both mother and son, Jesse Thomas, are doing well. We send our congratulations and best wishes. This Thursday saw the final session of the Parent/Teacher/Student Interviews for 2018. A big thank you is extended to our parents for taking time out of busy schedules to attend these sessions. The feedback from both staff and parents was very positive. A reminder is given that all teachers are available after school to discuss any issues with your child. Please contact the Admin Office to arrange a suitable meeting time. Our Primary students, from Kindergarten to Year 6, participated in the Scitech Roadshow Incursion on Tuesday 31 July and Wednesday 1 August. 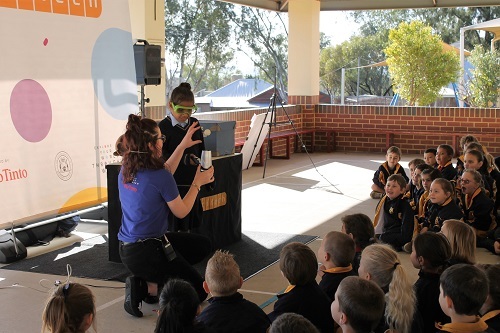 The incursion included a ‘Move It and Prove It’ Show and a hands-on workshop, all based around the Physical Sciences strand of the WA Curriculum. Year 10 students were given their Subject Selection forms for 2019. Please ensure that this form is handed back to School by Friday 10 August, 2018. Ms Sucking has organised extensive training schedules for those students who are keen to improve on their PB’s for individual events. Even the wet weather has not deterred the keen athlete. Supported by Gooda Judder Aboriginal Corporation and The York CRC, a group of keen Lego construction engineers have formed a Club to be held over 6 days in August and September between 3.00-4.00pm. All construction pieces will be on display at the York Show in September. The cost is $5 per child per day and classes need to be paid in advance. Interested Lego engineers must register to attend. Please contact York Community Resource Centre on 9641 2328 or email: York@crc.net.au for more details.